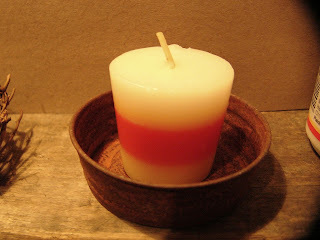 Here's a little different spin I thought I'd try with some cute candles. I call them Cupcake Candles. 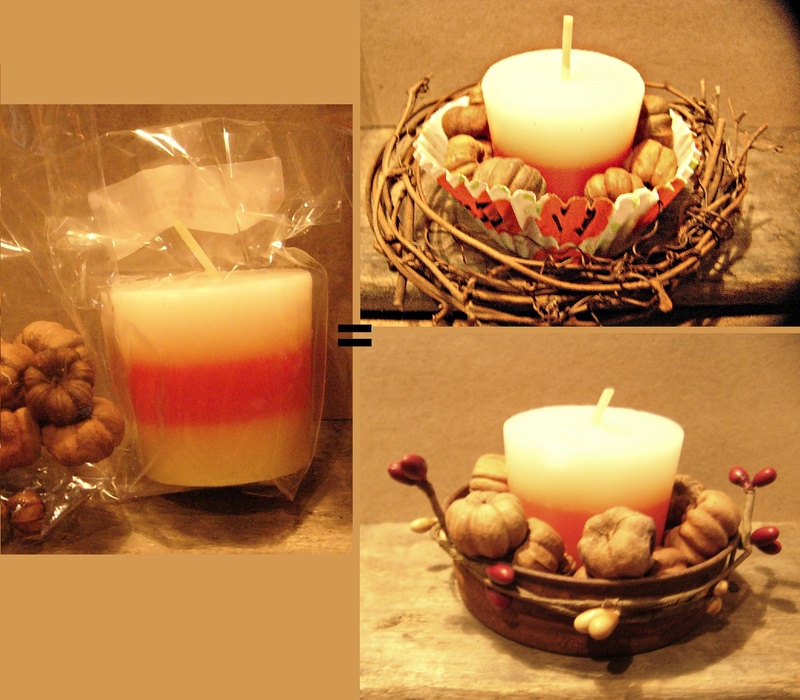 I had some candy corn style candles left over from my craft booth sales, and I was trying to find a way to re-do them to sale again. 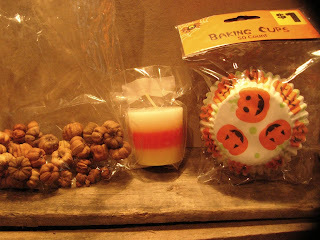 And then I thought about making something with the cute Halloween cupcake papers I had on hand. And then I thought, hum, what about some Halloween Cupcake Candles? They'd be cute tucked on a kitchen shelf maybe. Here's what I did. 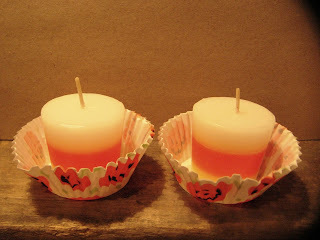 I took the cute little candy corn votives, (if you don't have this style, you can easily paint your own on the plain white ones with some yellow and orange paint,) Halloween cupcake wrappers and dried pumpkin pods. And later a rusty lid that I made. And glued them to the cupcake papers. Just to hold them in place good. 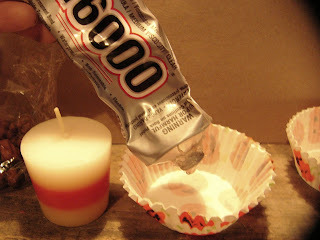 I used E-6000 glue from Walmart. 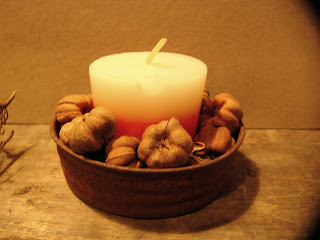 And then to dress them up, I tossed in the top, around the candle, some pumpkin putka pods. The pumpkin putka pds are used in primitive decorating for bowl fillers and crafts. 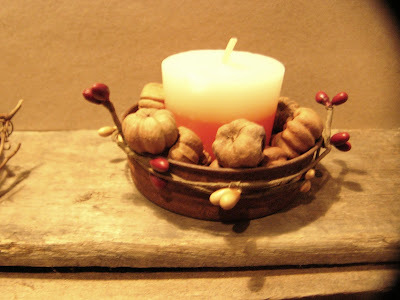 I found mine on ebay from a wonderful lady's store called simple*gatherings. You get 4 cups for only $5.74. So it really goes a long way. And then I took a bit of grapevine garland and made a circle big enough to hold it all. I think I may sit this on a dark little saucer of some sort also on my shelf. 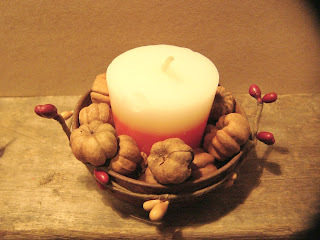 And to kind of finish it off, I took (ripped) a sprig of one of my pip berry garlands, and tied it around the jar lid. They are made of coated wire, so they bend very easily. And that is about it. So many ways you can really go about making these cupcake candles. I could have even put one of the cupcake, paper liners in the rusty lid too! I will on my next one. Hope ya'll liked this little idea for the votives. And remember, if you don't have the candy corn ones, just take the white, plain ones and paint a stripe of orange and yellow and BAM! You got'em. Hi Maggie! Thanks so much. I have to agree, I love Fall for the colors and the cool down around here. Thanks for following me, I'm on my way to check yours. Hi Maggie! Thanks! I love the rusty lid one better too! 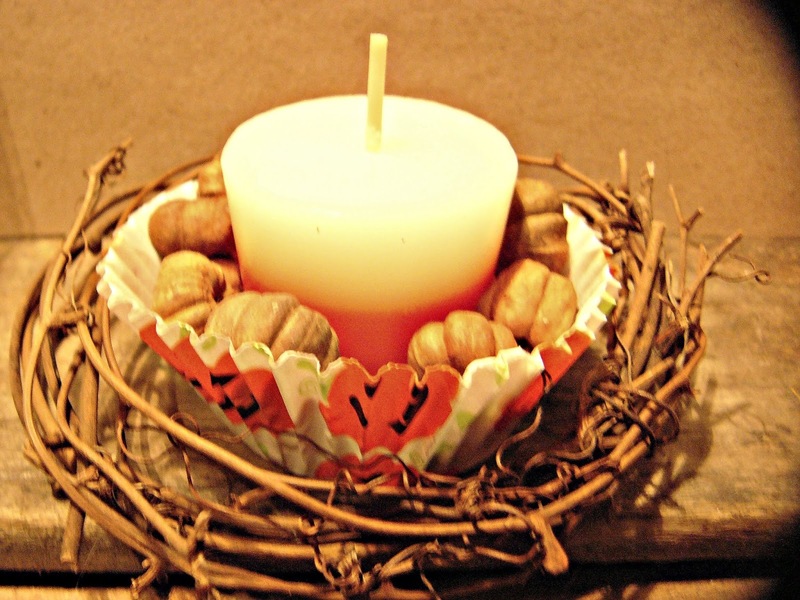 I am really getting into the Fall crafts also. I have no idea why your wordpress account won't post, but I will definitely look into the settings! Thanks for keeping up with mine, I also am subscribed to yours by email so I get your new ones soon as they post, lol. I love them all!